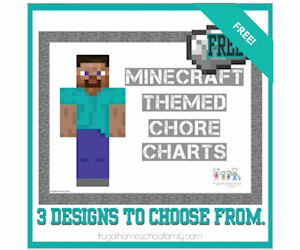 Get free Minecraft-themed Chore Chart with Educents! My husband and son are Minecraft addicts, so what a cute way to get some chores done. Hey don’t judge! I need to use every tool at my disposal to get some help around the house. Add it to your cart and checkout. You’ll then be given a link to print your charts for free. A mom’s gotta do what a mom’s gotta do. Never underestimate the power of Minecraft on young lives.